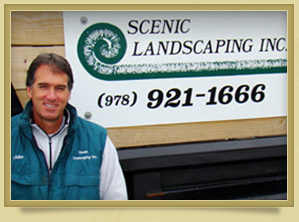 Established in 1984, Scenic Landscape, Inc. is a full service landscape design/build company that has built a reputation on delivering personal service, expert workmanship and value to our customers throughout Boston’s north shore and the surrounding communities. We design, install, and maintain new and existing landscape projects with the highest standards. We are also equipped to handle both large and small projects while always striving for a perfect end result. With founder and owner, John Desjardins, overseeing all landscape projects attention to detail is always a guarantee. Our uniformed staff is dedicated and always strives to provide exceptional quality workmanship. Most of our employee’s have been with us for over 10 years and their experience has helped support our continued growth. We are proud that we have been servicing a great deal of our clients for over 25 years while growing our business steadily due to our customer loyalty and commitment to excellence.